We dream of the days spent in Central Park, setting up a blanket and placing the picnic basket down, while dressed in a gingham full circle dress, with bright red lipstick and the cutest little bow set atop your head. As you wait for your sailor to come and meet you, you pinch a few flowers from wherever you see one and lay it on top of the basket for that extra touch. Its summertime, so the trees are alive and flourishing with green leaves. Those were the intimate gatherings you long for and miss the most. Suzanne Latapie, owner of Bistro chat Noir is here to make all our picnic daydreams come true this summer. 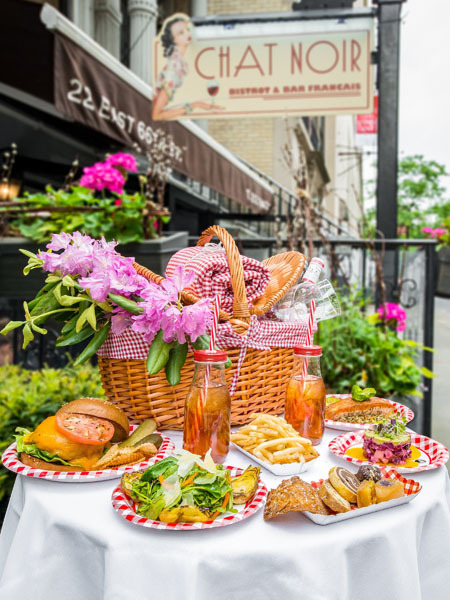 After receiving countless requests for food on the go from the chic Bistro Chat noir, which offers French fare with a taste of Montmartre on the Upper East Side, she decided to offer gourmet picnic baskets to go. As to no surprise, the baskets were a hit and people worshipped her ingenious decision. The gourmet-to-go picnic baskets are the perfect accompaniment for evenings at Shakespeare in the park, to a day lounging at Governors Island, or even before heading out to the Hamptons for the weekend. With everything contained in one stylish and cute basket, eating on the go is easier than ever before. Clients can customize their own basket with the choice of an array of made to order foods and drinks, as well as options for small decorations and other accompaniments for that extra touch of chic. Each basket is complete with the gorgeous reusable picnic basket, a gingham tablecloth, 2 appetizers, and 2 main courses, double order of homemade cookies, plastic glasses and cutlery for 2. The appetizers on offer include Red Beet Tartar, Chat Noir Mac ‘N Cheese and the Chat Noir Artichoke Salad. For the main course, patrons can choose 2 of either the Black Cat Burger, Chat Noir Chicken Salad, Salmon, Lobster Salad or the Roasted Duck Magret. To finish the evening, the cookie box for 2 includes chocolate and peanut butter truffle, almond tuile, chocolate and vanilla swirl sandy, financier with blueberries and lemon bars. As for beverages, the basket includes a bottle of Evian water or there is an option to order alcoholic beverages for that special occasion. 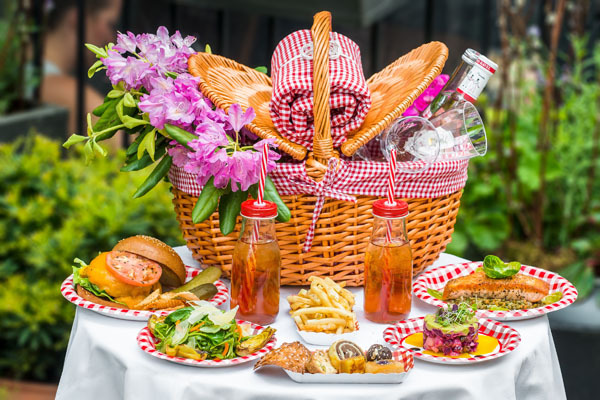 The Bistro Chat Noir gourmet-to-go picnic basket will re-invent your day outings this summer with a luxurious gourmet picnic basket, complete with a deluxe French meal you would most likely see on the lush green lawns of Paris.